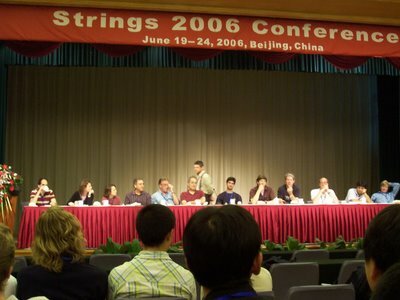 If you're here to read a clear-cut summary of the talks at Strings 2006 you've probably come to the wrong place. These posts will contain some of the thoughts of a young researcher for whom most of the lectures are way out of his area of expertise. I hope that other people can comment and contribute more elucidating accounts of what was discussed. Day one of Strings got underway in the usual understated Chinese manner with a public opening ceremony in the Great Hall of the People. I'd been warned that no cameras would be allowed in and so left mine behind. As we walked in film crews were shooting and digital cameras were going off left, right and centre. Consequently I have no pictures of the impressive hall or the interesting lectures which took place in front of the crowd of around 3000. I'll attempt to get some pictures from the other participants ASAP. After some introductions and a few short speeches about the new KITPC and the 10th anniversary of the Morningside centre for mathematical sciences (where one of the mathematician's who recently claimed to have solved the Poincare conjecture may well be coming to take up residence in the near future) came the main three speakers. First David Gross gave a general introduction to string theory. I was somewhat worried when a slide came up with the title 'superspace' and he began talking about anticommuting numbers but in fact he managed to keep it at a level that would have given the non-physicists in the audience a reasonable gist of the idea. There wasn't anything terribly controversial in what he said and in contrast to Hawking's lecture in Hong Kong where he spoke about the need for the human race to jump ship from the Earth ASAP none of the lectures were particularly edgy, though they were all well done for the audience concerned. Sitting behind Witten and Vafa I didn't think that they'd learned anything new but they seemed entertained by parts of the talks. He did mention a little about emergent spacetime and quoted Witten's prophecy that 'Spacetime may be doomed' and Nathan Seiberg that he believes that 'space and time are illusions'. Andy Strominger spoke next and pleased the crowd with his opening remarks in Chinese. Having stayed here for some time his Chinese is rather impressive. His talk was on the topic of black holes in string theory which is a huge area of interest for many reasons, including understanding the black hole information paradox. With illustrative cartoons, Andy's was the most lighthearted talk (though the content is clearly not simple) and his friendly style seemed to sit well with the audience. The main event was a talk given by Stephen Hawking. Before he came on, a wave of people rushed to the front, cameras and telephoto lenses at the ready. As he entered the hall, a frenzy of cameras dazzled the stage as everyone wanted to get a photo of such a physics superstar. The chairman asked for calm and told people that Hawking had specifically requested no flash photography but everyone ignored him completely. It was all pretty embarrassing, even when the chairman said that last time Hawking said that the journalists acted like barbarians towards him, this didn't budge them and they kept snapping away. In fact, even when ordered in Chinese it still took a good few minutes to clear them and all through the talk there were still flashes around the room. The request had been made because apparently the system that he uses to control the speech and the slides will not work with flashes going off. Anyway, nothing particularly (newly) controversial but his talk was about the beginning of the universe. He spoke about his work with Roger Penrose showing that the beginning of the universe had to have a singularity and he mentioned the Hartle-Hawking wave functional of the universe where questions about the beginning of time become non-sensical, just like asking where is South of the South Pole. Having caught the bus at 6.40 in the morning everyone was feeling pretty shattered after three hours of talks so we were quickly rushed back to the main conference venue where we dived into the buffet. Tasty enough (with good spicy tripe) but nothing in particular to write home about. Unfortunately they're toning down the Chinese aspect for the sensitive stomachs so I'm hoping to take a few participants out to get some real local food. So, now comes the part where I'm on far more shaky ground. As I've mentioned before, my path in string theory is a very narrow one and there are many mainstream areas in which my ignorance is gaping. I will write short reviews of some of the talks that interested me but if other people would like to comment and fill in the gaps with comments then I will be happy to post the comments in full in a separate posting once I've collated them. The first talk was by Witten on 'gauge theory and the geometric Langlands program'. This is an interesting link between a proposal which appears at first sight to live purely in the language of number theory but it was shown in concrete terms by Witten and Kapustin that in fact the dualities involved on the number theory side actually translate into interesting dualities in field theory. I attempted to write a summary of the talk but it ended up being more complicated and convoluted than just linking to this slightly older talk which was presented before his paper which came out earlier this year. If anyone wants to write a short review of the talk then I would be most grateful. Unfortunately though my maths is just about up to understanding the terminology and probably most of the individual paragraphs, it's not good enough to feel I have an overview of the whole thing. Lecture two was by Vafa on 'The Swampland' which I've been unaware of until very recently. String theory gives an immensely large number of solutions and we have no way at the moment to pick uniquely which one gives the physics we see around us. Doing this would be perhaps the greatest triumph that we could hope for from string theory (give or take some cosmological answers). Anyway, there's a huge debate about the interpretation of the landscape which I'm pleased hasn't dominated too much at the conference so far. The swampland hypothesis takes a different view. It says: Let's figure out what properties a field theory has to have in order to be inconsistent with string theory. That is to say, which classes of field theories can't possibly be in the landscape? Which are in the swampland? It has been hypothesised that there are several criteria of a theory which will preclude it from having a consistent UV completion with gravity. The moduli in the string landscape are always parametrised by the vevs of scalar fields. These moduli cannot have finite non-zero directions. At the infinite points in moduli space you will always find an infinite tower of massless states. Near these points the moduli space has negative curvature. There are no non-trivial one cycles in the moduli space. This all sounds reasonable but it could be a powerful new direction away from the current concentration on the range of possible string vacua. It seems that what is important is to tighten these constraints and find more so that we can define all those theories which can live in the landscape by finding out exactly which can't. Third was a double talk by David Shih and Ken Intriligator about dynamical supersymmetry breaking and metastable non-susy vacua. This sounds like some impressive work in which they've used Seiberg duality in certain regions of (Nf,Nc) space to understand the small field behaviour of the potential of scalars in an N=1 SUSY theory. They've shown that for a certain class of N=1 SUSY theories that a metastable vacuum solution can exist and that the decay time for tunneling to the zero potential in the susy solution is large. It was pointed out that at finite temperature this stability will clearly be removed so in a cosmological context this would complicate matters. Next were lectures by Hiroshi Ooguri and by Xi Yin on counting states in a D4-D2-D0 system. Again I'm at a loss to summarise these talks in any way whatsoever so ask for anyone who wants to volunteer an explanation. Hiroshi was talking about a particular quiver gauge theory in which dynamical susy breaking a la Intriligator and Shih is seen. After dinner was a one hour discussion session chaired by Andy Strominger. An impressive panel of string theorists (see top of post for photo) was asked questions between its members and from the audience on any physics topic they could think of beyond questions of tenure and funding. Unlike the reports of last year, there were no great arguments and indeed almost no mention of the landscape at all. There was talk about the fact that we haven't been able to study very high energy scattering using string theory. There was a brief discussion of the LHC Olympics and the fact that string theorists should attempt to integrate themselves with the experimental/phenomenological work as much as possible. There was also a bit of chat about the ideas of emergent dimensions and the AdS/CFT correspondence and what directions we may be able to push the concept to understand it more. Interesting though it was I don't think that a great deal was learnt from it. This is probably because everyone was shattered at the end of a very long day and were perhaps wary about last years antics. OK, so I appear to have stumbled my way through all of that with little in the way of useful comment so I ask anyone who can expand in a more useful manner to either e-mail me or add a comment. Hey man. You're in the news! Please expand on this slightly surprising statement. I'm intrigued. Wow, sounds like an interesting conference to be at. I was rather surprised to see the picture of all the foreigners at the table up front. Yeah, a great conference to be at. The table of foreigners is a selection of many of the top string theorists in the world. That was a question and answer panel session designed to get some interesting topics flowing. Unfortunately, though a good idea, the timing meant that many people were a bit too tired to fully engage.